- USDCAD set to fall even after BoC quits hiking says Commerzbank. - As USD is overvalued and will correct lower before the year is out. - But GBP/CAD set for gains as Brexit fog lifts from over London. The Canadian Dollar is still likely to rise against its U.S. rival this year according to analysts at Commerzbank, as the big Dollar has even further to fall than its Canadian counterpart, although the Pound-to-Canadian-Dollar rate is still expected to rise substantially in 2019. Not even the recent u-turn by the Bank of Canada (BoC) on its earlier interest rate guidance will be enough to keep the USD/CAD rate at its current lofty levels for much longer, because the U.S. Dollar is heavily overvalued and will soon come back down to earth, Commerzbank says. "Our US experts now see a higher probability that the Fed's next interest rate move will be a cut, rather than a hike. The end of the US rate hike cycle should weigh heavily on the US dollar, which is why we expect the Canadian dollar to appreciate against the US currency," says Thu Lan Nguyen, an analyst at Commerzbank. Commerzbank told clients following the latest review of its foreign exchange forecasts the U.S. economy is likely to grow by just 2.5% in 2019, down from 2.9% last year, and that growth will fall below 2% next year. The bank forecasts U.S. GDP growth of 1.8% for 2020. That slowdown is expected to sap inflation pressures from the economy and when combined with White House criticism of earlier Federal Reserve rate hikes, is enough to convince Commerzbank that U.S. rates will not be going any higher for a while yet. This change in the Federal Reserve outlook combined with the additional slowdown in the U.S. economy could easily undermine the Dollar later in 2019 if, further down the line, economies elsewhere in the world begin to show signs of stabilisation. "As the BoC is also highly likely to abandon its normalization plan in order not to diverge significantly from the Fed's monetary policy, the CAD is unlikely to gain too strongly though. Moreover, since the Canadian currency does not appear to be as overpriced as the US dollar, the US dollar correction should ultimately be the dominant driver in USD-CAD," Nguyen writes, in a recent note to clients. Canada's Loonie has weakened notably against the U.S. Dollar in the last six months after the Bank of Canada told markets it will raise interest rates much more slowly in 2019 than it had done previously. In March, the bank stopped just short of saying it doesn't expect to raise rates at all this year. 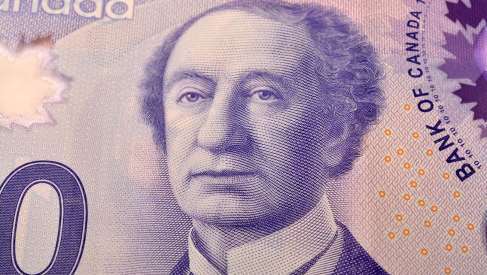 A bust in the oil market slowdown in both the Canadian and global economies that first became clear in the final quarter of last year was seen behind the Bank of Canada's change of heart. Oil prices have since stabilised but there is still a high degree of uncertainty about what 2019 has in store for the economy. 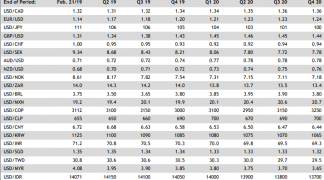 However, and despite the USD/CAD rate now being 4% higher than it was at the beginning of the final quarter 2018, the Canadian currency is the best performer in the G10 basket this year and is tipped to go further still. "The market has already priced out interest rate hikes by the BoC and now sees a greater chance for interest rate cuts, as it does for the Fed," says Nguyen. "It is true that the BoC is indeed likely to abandon its normalisation plans. However, economic growth is unlikely to slow to such an extent that the BoC will have to resort to a loosening of monetary policy. This should limit the depreciation potential of CAD." 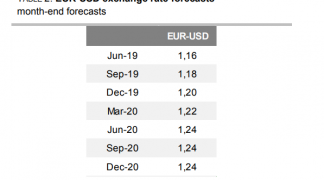 Nguyen's forecasts put the USD/CAD rate at 1.32 by the end of June, which isn't far below the 1.33 rate that prevailed Tuesday. But they also pencil in a further decline all the way down to 1.27 in time for year-end. That would reverse all of the gain seen since the end of September 2018. Commerzbank forecasts the Pound-to-Canadian-Dollar rate will rise to 1.78 before the end of June, from 1.73 on Tuesday, but projects the exchange rate will fall back to 1.76 in time for year-end. However, Nguyen is due to update those forecasts this week once the outcome of the latest Brexit debacle becomes known.